Fish or vegetables steamed with spices. A vegetable, that has been put inside the pot in which rice is cooking, and it has been cooked along with the rice. Generally, you get potatoes, butternut squash, raw papayas, bitter gourd, snake gourd and okra in the rice. 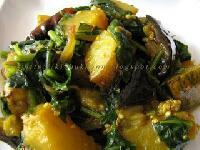 Bengalis often eat it with a tinge of mustard oil and salt. 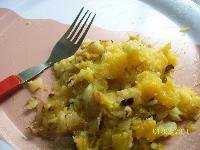 However, a very popular onedish Bengali meal is alu bhate bhat, which is potatoes boiled along with rice, and then served along with the rice. For this, generally gobindobhog atop rice, which is a shortgrained, glutinous rice that cooks quickly, is used, and is preferred to the longgrained rice, because of its creamy quality, and ability to become ever so sticky, which aids the dish when it comes to mashing. During the serve, some fresh ghee or butter, and salt to taste, to be mixed and mashed by hand into the right consistency, and then eaten. A raw green chili, and a boiled and shelled egg sometimes accompanies this dish. Any vegetable, such as potatoes, beans, sour mangoes, papaya, pumpkins or even dal, first boiled whole and then mashed and seasoned with red shallot, fresh chile, mustard oil/ghee and spices. Usually a vegetable dish with one or more varieties of vegetables cut into longish strips, sometimes with the stalks of leafy greens added, all lightly seasoned with spices like mustard or poppy seeds and flavoured with a pouron. Sometimes a chochchori may have small shrimp. The skin and bones of large fish like bhetki or chitol can be made into a chochchori called katachochchori (kata meaning fishbone). The stir frying process and the lightness of a chochhori is not unlike that of chop suey, which is a term for assorted pieces, and this shows the influence of the Chinese in Bengali household cooking. The chochhori would be generally an assortment of vegetable and fish bones and other things that would have been rather thrown away, fried in a korai,(a slightly rounded wok), over high heat at first, and then simmered to let the vegetables cook down to being just done, and then taken off the flame immediately to stop cooking. 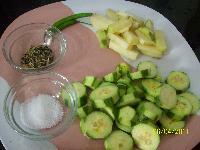 The cooking procedure adds to the confirmation of the entrance of Chinese style of cooking into Kolkata during the mid1800s, prior to which this particular dish was not very popular in Bengali cuisine. Very different from the cutlets of the Brits, this is referred typically to a crumbcoated, thinly spread out dough, made generally of chicken/mutton minced, mixed together with onion, bread crumbs and chillies. 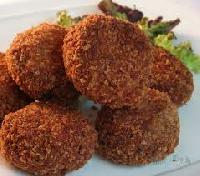 Generally it is then dipped in egg and coated in breadcrumb, fried and served with thin julienne of cucumber, carrots, radish and onions. Often an egg mixed with a teaspoon or two water and a pinch of salt is dropped on top of the frying cutlet, to make it into a kabiraji, the Bengali pronunciation of a Coverage or Cover:Egg Cutlet, influenced by the British. 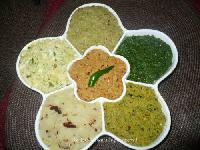 Tiny pieces of one or more vegetable, generally a dice of vegetables along with general odds and ends, often even the peels (of potatoes, squash, gourd, pumpkin, bitter gourd, or potol for example) usually flavoured with pachpouron, whole mustard seeds or kalo jira. Chopped shallot and garlic can also be used, but hardly any ground spices. 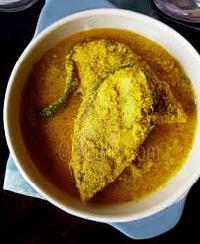 Generally Bengal is one of the pioneers for this particular dish, making it with everything, including preserved mango sheets, called amshotto. Mixed vegetables or eggs, cooked in a medium thick gravy seasoned with ground spices, especially gorom moshla and a touch of ghee.